Leveraging on our vast experience we manufacture and supply a wide range of Kids Mannequins. 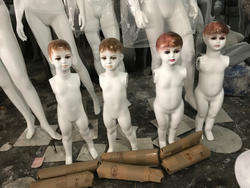 This range consists of Molded Hair Kids Mannequins, Headless Kids Mannequins and Zoozoo Mannequins that are available in various sizes and shapes. We are one of the most prominent manufacturers and suppliers of the industry, engaged in offering a wide range of Headless Kids Mannequins. These products are suitable to display various dresses of kids. Our products are available in various postures and almost provide a real look. Our skilled professionals supervise product development stages to ensure deliver of a quality tested range. We offer a superior range of Standing Kids Mannequins for our customers in the market. 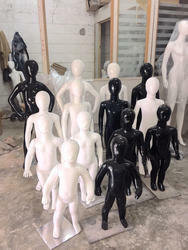 Kids Mannequins which are available in various sizes, patterns and finishes. Presenting you an exclusive and elegant collection of kids display mannequins ranging from toddlers, infants to 10-15 years kids. All these are available for boys and girls both. These Kids Display Mannequins create an alluring effect on the clients and prompt them to purchase. These Kids Mannequins are also light in weight and have been intricately carved to provide them exact feel of a human hand. These Kids Mannequins can be customized in terms of size and posture as per the specific requirement of our customers. 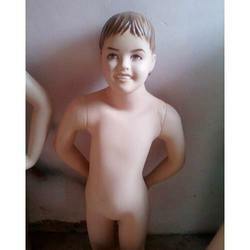 Our firm is a well-known manufacturer and supplier of a large gamut of Child Mannequin. The provided product is designed and fabricated using optimum quality raw material and crafting methodologies that assures durability and strength. In order to cater to the huge requirements of our wide client base, these are available in several sizes, heights and postures. We offer wide range of Kids Mannequins. These products are made from high grade raw material to provide durability and high performance at customer end. They are available at competitive prices. Looking for Kids Mannequins ?